Hello, and welcome to Teaching Reading with Bob Books. Before I begin, I feel it is imperative to explain something that probably goes without saying, but is still important enough to say (just in case). In order for a child to learn to read, they must already know their letters, both upper and lower cases. They must know these letters well. Being able to identify the letter symbols is the foundational building block for reading. The reading lessons on this blog are going to assume that children are actually ready to read, meaning that they know their letters. If you are interested in teaching letters to small children, you can check out the Letter Lessons posts. A second prerequisite is that the child must understand that letters make sounds. I usually tell my students this in the context of animals. What sound does a cow make? “Moo.” And what sound does the letter s make? “Ssssss.” Students tend to connect and accept this just fine. When it comes to vowels, I tend to not tell children that vowels have a special name, until they are farther along in reading. What I do say is that some letters, like the letter a, make lots of different sounds. But this is no different from animals, either. Some animals, like deer, are pretty quiet, and some, like the mockingbird, have a whole host of different sounds. So when it comes to certain letters, we will learn that they have more than one sound, and that’s okay. Okay? Okay. A third prerequisite for reading, which is actually a prerequisite for teaching a child anything (up to and including potty training), is that the child be trained to attend to and obey your voice. If you are attempting to teach a child that fights you on everything, do not be surprised when “everything” includes reading lessons. In my next post, I’ll explain the necessary tools of the trade. I am not sure how you have the time to do this, but thank you! I love Dr. Seuss's ABC book, too! I've been using the Tasha Tudor book with the girls, but I plan to go back to Dr. Seuss with Baby O.
I noticed that Bob Books actually have what they call "pre-reading" books now. I haven't checked those out yet…Maybe O. would like those, too, when the time comes. 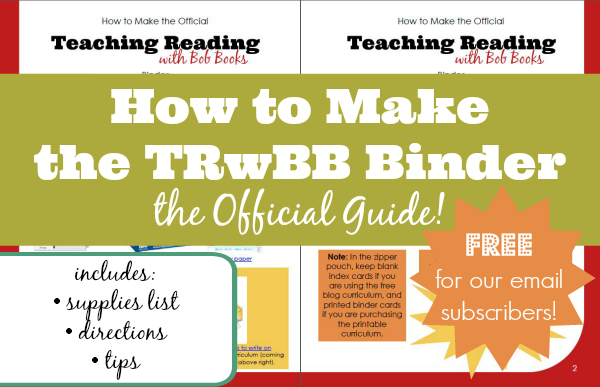 We don't have Book Books, but even so, this looks like a great resource! Have you studied what Charlotte Mason said about teaching reading?